Featuring 14 Gourmet Hot-Grilled To Order Subs, including our Signature Philly Cheesesteak as well as Salads, Wraps and Cold Deli-Classic Style Subs. Enjoy our signature Fresh-Cut Fries, Fresh-Squeezed Lemonade and Chocolate Chunk Cookie. Have a meeting, sports event, convention, tournament, team, fieldtrip or other large group to feed? Penn Station offers Party Platters, Box Lunches, Gallons of Lemonade, Iced Tea, Sweet Tea and Cookie Trays. Voted America's Highest Quality Sandwich and Fort Wayne's Best Tasting Sub. Locations close to shopping malls, Fort Wayne Children’s Zoo, Memorial Coliseum, Spiece Fieldhouse, The Plex, SportsONE/Parkview Ice House, Universities, Medical Facilities and area attractions and hotels. 1 mile west of I-69 exit #316, near Parkview North Hospital, Dupont Hospital, Debrands Fine Chocolate Factory Tours, north side hotels and 10 min. from Spiece Fieldhouse. 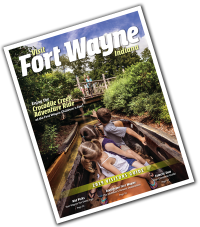 For special rewards join our EClub at www.psfortwayne.com or Mobile App.